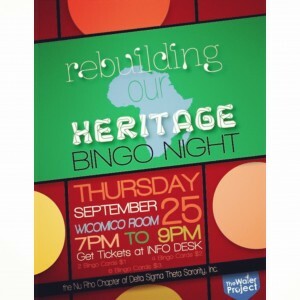 The Nu Rho Chapter of Delta Sigma Theta Sorority, Inc. is proud to present The Rebuilding Our Heritage Campaign. This is a campaign where we come together with the people in our community to help fund a clean water well in Africa. Clean water is essential for living and many families in Africa do not have that luxury to drink clean water. Many children are not going to school due to the lack of no clean water. Sickness and disease are on the rise and many of these families do not have a stable place to live. We need your help to make a positive impact in these people's lives! DONATE! DONATE! DONATE! Without you many of these families will be going to bed thirsty. It is up to you to make a difference so ACT NOW!